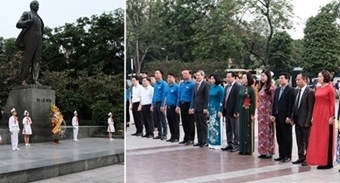 Foreign Ambassadors to Vietnam have extended Lunar New Year (Tet) wishes to Vietnamese people on the threshold of the country’s biggest traditional festival. Visiting Nguyen Dinh Chieu Primary and Secondary School in Hanoi, the G4 ambassadors rejoiced to prepare Tet with blind children there. Meanwhile, New Zealand Ambassador to Vietnam Wendy Matthews expressed her hope that people will join efforts to build inclusive societies, where everyone is respected and valued. “I believed in Vietnamese, there is a saying that sums this up “Tuong than tuong ai” and then in Maori language, the indigenous language of New Zealand, there is a term “Kotahitanga”, which similarly means “oneness” and “unity”. We all know that together we are stronger”, she said. Wishing 2019 as a year of inclusion and no one left behind, Norwegian Ambassador to Vietnam Grete Lochen said: “This is particularly important for children, they are the future of our society. Here at this school, it is wonderful to see that all children are included”. As for Swiss Ambassador to Vietnam Beatrice Maser Mallor, she wished Vietnamese, especially all children in the country a Happy Tet, and the prosperous Year of the Pig. Danish Ambassador to Vietnam Kim Hojlund Christensen wished people across the nation a new year of good health and prosperity in Vietnamese. He emphasised highlights in bilateral relations in 2018 with various high-level visits, strong cooperation in the fields of economy, trade, food, agriculture, healthcare, green growth and cultural exchange. The ambassador said he will do his utmost to deepen and diversify the multifaceted collaboration between the two countries in the coming time. Tet greetings to Vietnam were also delivered by US Ambassador to Vietnam Daniel J.Krintenbrink.